Did you know that vegetable garden soil preparation is an important first step for successfully growing your own food? 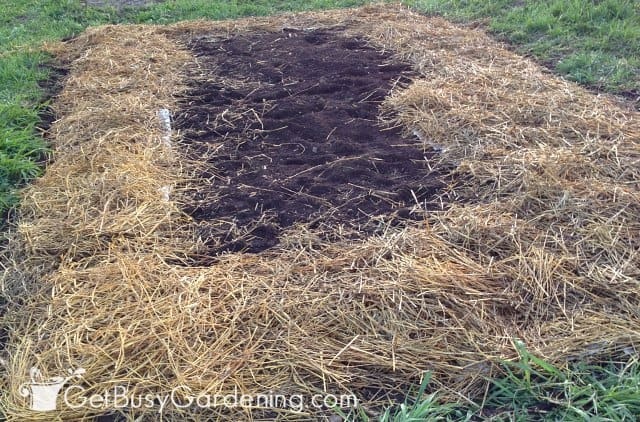 Below I will show you exactly how to prepare a garden bed for planting vegetables, including details about building the best soil for garden beds, and tips for adding organic soil amendments for vegetables. 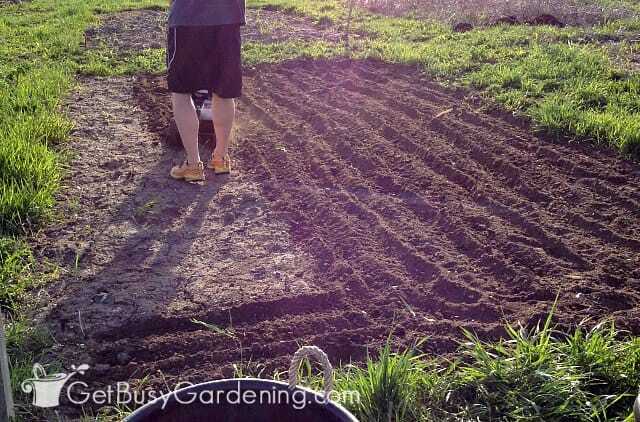 How do I prepare soil for a vegetable garden? What do you put in the soil to enrich it? 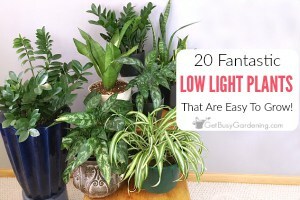 In this post, I will show you how to prepare last years garden for this year. 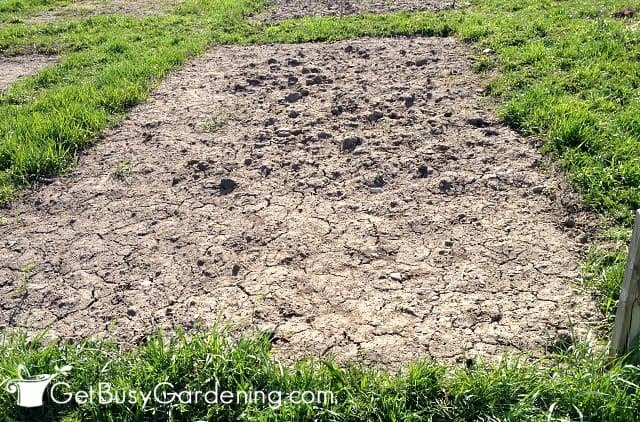 So, if you have an existing garden bed that’s not completely overgrown with weeds or grass, then this is the post for you. On the other hand, if you’re looking for information about preparing a garden bed that is currently covered by grass or weeds, then skip ahead to part 2. Before I dive into the details of how to prepare garden soil for planting, let’s talk a moment about vegetable garden soil. A common question I get asked by new gardeners is “is topsoil good for a garden?”. I mean, garden dirt is dirt, right? The answer to both of those questions is no. You need high quality soil for growing vegetables, that is super important. Topsoil is some of the cheapest dirt you can buy, and is usually made out of very poor quality… well, dirt. Vegetable garden soil needs to be rich in organic matter, and contain tons of nutrients in order for vegetables to grow. So, you want to build the best organic soil for your vegetable garden as you can. If you don’t know how good your soil is, or you’re not sure what to add to it to prepare soil for a garden, I recommend you test the soil. Don’t worry, garden soil testing is super easy to do at home using an inexpensive soil test kit. Learn more about how to test your soil at home. 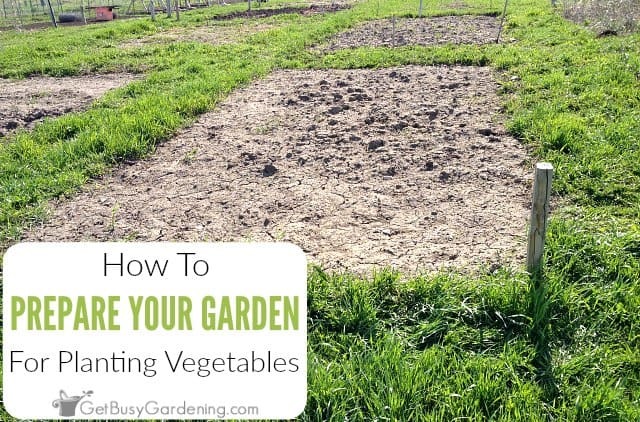 When you have an existing garden plot, preparing a garden bed for planting vegetables is pretty easy. One of the community garden plots we rented last year was used before, but it was neglected until we adopted it. The plot was pretty clean but was partially covered by a thin layer of weed seedlings, and the grass was creeping in all around the edges. Below are the steps I took to get this neglected garden plot ready for planting. Step 1. Remove as many weeds as possible: First I removed as much of the grass and weeds as I could. Most of the weeds in this garden were pretty small and easy to pull. Tiny weeds will be taken care of in the following steps so you don’t have to remove every single tiny little weed in this step. But try to remove as many of the established weeds and grass roots as you can. Use a shovel to cut the garden edges and turn the soil to make it easier to pull the grass and weeds. Step 2. Add edging to keep the grass out (optional): This step is optional, but it really helps keep grass and weeds from creeping in around the edges of the garden. I use the black plastic edging, and that does a great job of keeping most things from creeping in. You could spend a little extra money and buy fancier edging, like bricks or concrete bullet edgers. 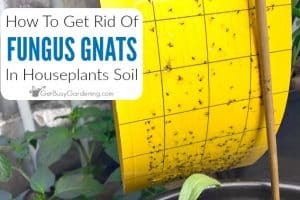 Just sink them into the ground so they help keep the weeds and grass from growing underneath. Step 3. Add soil amendments for vegetables: Once all the weeds have been removed, it’s time to add organic soil amendments. I had to amend clay soil, so compost was a definite must for this vegetable garden bed. Compost is a natural fertilizer for your garden and a great amendment to any type of garden soil. Plus, compost is pretty inexpensive to buy in bulk. I like to add enough to my garden so that the compost is 1-2″ deep. Our community garden plot is 10′ x 20′, and I added one yard of compost to it. You could add more if you’re working with poor quality soil (e.g. : extremely sandy, rocky or hard clay soils). This is also the perfect time to add granular organic vegetable fertilizers to build the best garden soil you can. 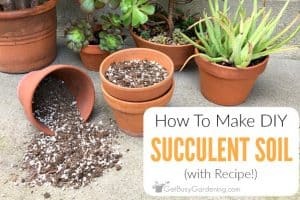 There are a several wonderful organic gardening fertilizer options on the market these days, and they are super easy to use. I use, and highly recommend this organic vegetable garden fertilizer or this natural vegetable plant food in my gardens. This is also a great brand of all purpose granular fertilizer, and organic worm castings are also a fantastic soil amendment for the vegetable garden. Step 4. Till the soil (optional): Tilling (aka cultivating the soil) is another optional step, you definitely don’t need to till your garden. Tilling mixes the soil amendments into the existing garden soil, and also helps to break it up, making it easier for plant roots to penetrate the soil. We use a small garden cultivator to make quick work of tilling our vegetable plot. But you could just plant your vegetables directly into the top layer of compost, or turn your compost and fertilizers into the soil with a shovel or pitchfork if you prefer (or get yourself a garden claw, one of my favorite tools!). Step 5. 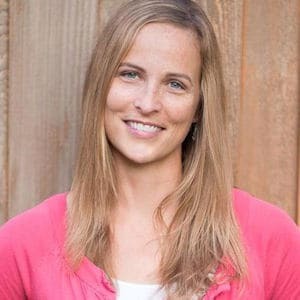 Add a thick layer of mulch: Mulch is the key to keeping the weeds down, and it also retains moisture in the soil so you don’t have to water your garden as often. 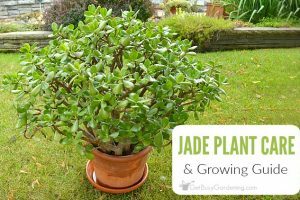 It also adds more nutrients to the soil as it breaks down over time, helping to build rich, fertile garden soil. Before mulching your vegetable garden, you could lay down a thick layer of newspaper to help with weed control if you want. 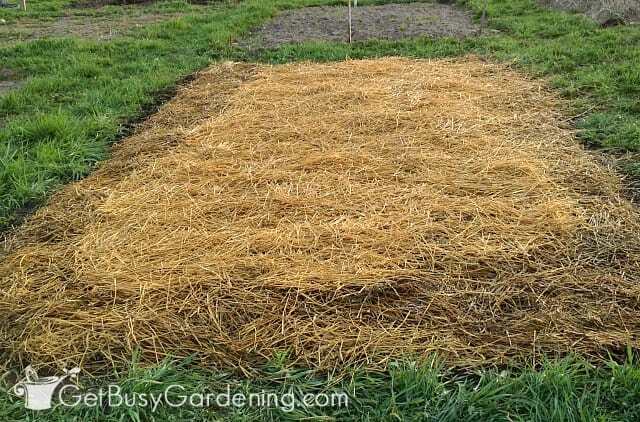 I mulch my vegetable gardens with straw because it’s inexpensive and readily available in my area. But you could use other types of mulch for vegetable gardens, like leaves for example. That’s it, now your vegetable garden is ready for planting. When it comes to preparing garden beds for planting vegetables, it’s super important to build the best garden soil that you can. Adding compost and other organic soil amendments, tilling or turning the soil, and mulching are all fantastic for preparing soil for growing vegetables. And, once you get into the habit of taking these steps year after year, you’ll be sure to always have the best soil for growing vegetables. 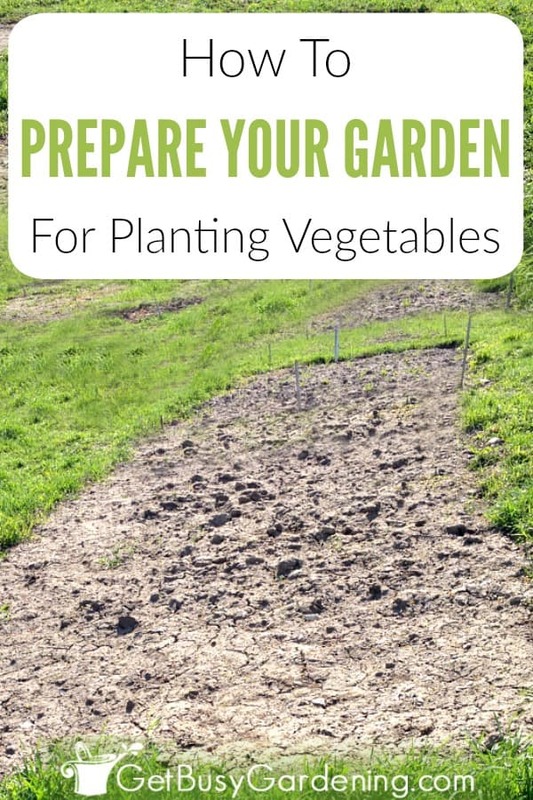 Share your tips for how to prepare soil for planting vegetables in the comments below. Our big step this year was adding compost to our beds. What a difference! Like you said, it’s really cheap in bulk and we even had some extra for our flower beds after we added it to all our raised veggie beds. I went for the whole optional tilling deal this year, just didn’t have time to till! Still, I think the gardens ok. I took over a weed infested garden this year and the part I tilled early in the season for potatoes had more weeds come back than the part where I simply poured the compost on top after weeding it. There’s a third section that is so over grown I didn’t even plant it this year. I covered it in cardboard and have been dumping my grass clipping on top to smoother them … seems to be working well so far this season. I have read that it’s a good idea to get your soil tested for nutrient deficiency. 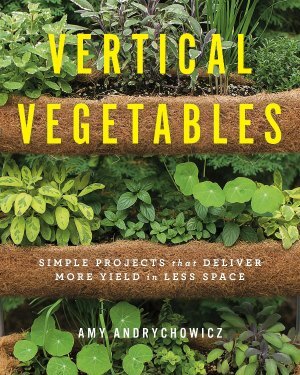 Do you think for a small vegetable garden (4′ x 8′) that it’s really necessary to do that? 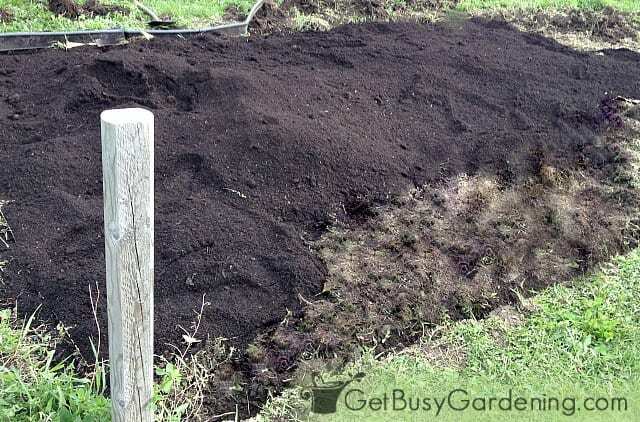 Or does just adding a layer of compost give the soil enough nutrients? Where do you buy compost? I compost at home, but won’t have enough for all my beds. You can buy compost anywhere you buy mulch. If I only need a little bit, I buy it in bags at my local home improvement story or nursery. If I need a lot of it (like I did for this garden), we buy it in bulk at the local organics recycling facility or landscaping materials company. They dump it right into your truck for you. Just search “buy compost [your city]” in Google and you should find places in your area. But check with your city first, because many cities give compost away for free to their residents.